It is a new mode of flight with paramotor that is raging among the most intrepid and adrenaline riders, the slalom. The king mode in the current competitions of paramotor. 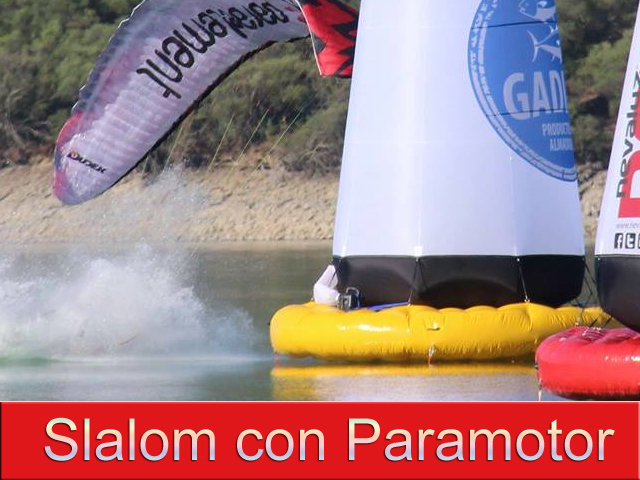 The several times paramotor world champion Ramón Morillas, has collaborated with us in the implementation of the first permanent training center of slalom with paramotor. Regardless of your level of flight, the course with Ramón Morillas offers a progression system that adapts to each student, you will enjoy these modalities, whether you compete or if you are only looking for new emotions in flight. The ideal course is a minimum of 4 days, although we can also adapt to the needs of groups or country selections. We have a permanent slalom circuit with pilones over water in the CAT facilities in Lake Bornos, where progress in the techniques of competition, of course when making the flights over water the safety and tranquility of the pilots is total. We have rescue boats in case of fall to the water, after 4 years of practices on water we can affirm that it is the only way to be able to enjoy this modality without problems, also in less than 20 minutes of work after falling into the water we have Again all the equipment arranged for the flight. In the slalom we must use and mix different actions like the trimer / peka, command / tips, high speed controls, accelerator pedal, gas control, weight changes etc ... the student in a progressive way will master these tricks .